How many times does your brand's message or ad needs to be exposed to your audience for them to act on it? While there are no definitive numbers out there, and many marketers use tools such as econometric modeling to figure out an "effective frequency" number for exposures, Artificial Intelligence is going to come into play to help you decide. That's what will trend in 2018. Research has shown that the minimum number of exposures for a good recall is around 10. There's a school of thought that states that repetition is essential to generate audience response*. And then there's the audience who gets really turned off seeing a message over and over again. It's called 'copy wear out' in media terms. So where's the middle ground? With consumer attention being the currency that every marketer is trading in today, we need help. And, like in many other areas of marketing technology, AI will probably rise to the occasion and come to our aid. With multi-channel marketing now common across digital and social (and, traditional offline as well, of course), there's a huge amount of exposure that our message can actually get. Provided, of course, the media dollar is behind the push. But how much is enough? We are seeing advances in AI powered technology and tools that are able to predict ad effectiveness and the right frequencies on programmatic media exercises. 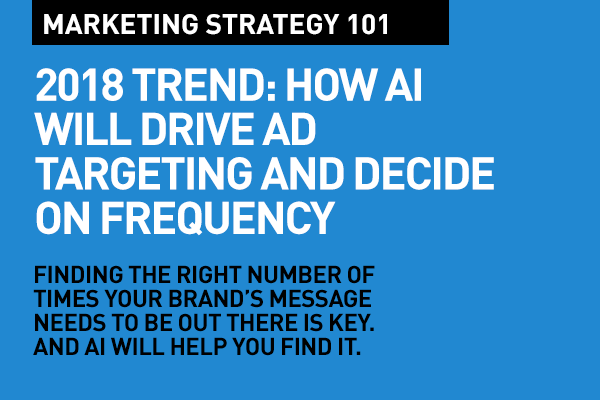 AI is also playing a role in cross-targeting, remarketing and bringing a much needed sense of consistency of message to a particular audience. Even, one by one. One pair of eyeballs at a time. That's the magic of ad tech. Ad tech works with data and targeting, using clever algorithms (sometimes generated on the fly) to empower brand marketers and publishers to improve the effectiveness of their campaigns by getting frequency right. The beauty of AI is that these Intelligent are learning every second – increasing and building on their intelligence. And because of this, they can modify and customize the campaign and the exposure quotient based on the learning. Rather than relying on intuition, these AI based algorithms are based on actual experiences. They are also capable of quickly learning from not just exposure, but time of exposure, frequency within a certain time frame, and response levels. So, they can actually change creative quickly, on the fly. Or simply stop targeting a non-responsive member of the target group to make the spend a lot more effective. Overall, that's a lot of dollars and sense for marketers. The intelligence may be 'artificial' but for us, it is very much real. Please share this post with your friends and colleagues, and feel free to add your comment below. Pay Per Click Advertising Nice Blog post. Helpful information about marketing. I really loved your blog post . The information you have included in your blog is really amazing and helpful for the readers. Thanks for sharing a great stuff! Thanks for your information. Excellent post.